The as yet unidentified photographer was standing at the entrance of Ueno Park looking towards the city. He clearly wanted to show the 10 meter tall American style windmill that was used by the Agricultural Bureau (勧農局, Kanno-kyoku) as an exhibit of the First National Industrial Exposition in Ueno (第1回内国勧業博覧会) in 1877 (Meiji 10). It pumped groundwater. A windmill, possibly the same one, was exhibited again during the Second National Industrial Exposition in Ueno in 1881 (Meiji 14). 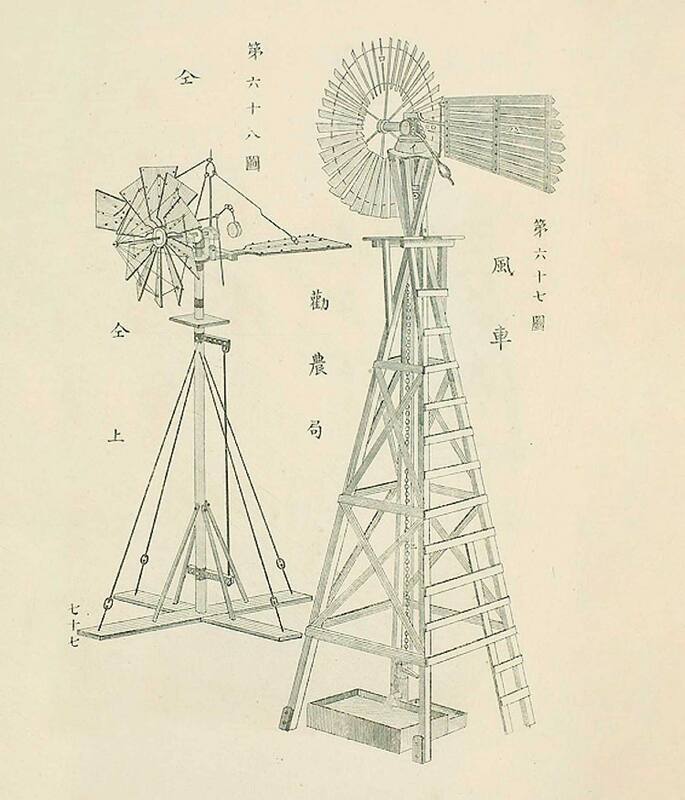 Contemporary technical drawing of the American style windmill exhibited at the First National Industrial Exposition in Ueno (第1回内国勧業博覧会) in 1877 (Meiji 10). Courtesy: National Archives of Japan. Ukiyoe by Japanese artist Kyosai (暁斎) showing the windmill at the First National Industrial Exposition in Ueno in 1877 (Meiji 10). Although the windmill was a popular subject on Ukiyoe woodblock prints of the time, photographs of it are exceedingly rare. I have seen only one other photograph of the windmill, and have not yet found another print of the photo shown on this page. So you are seeing something here that very few people alive today have ever seen. If you are aware of other photographs showing this windmill, or other prints of this one, please do let me know. The unique scene on the photograph would have never come to pass without Dutch military doctor Anthonius Franciscus Bauduin (アントニウス・フランシスクス・ボードウィン, 1820~1885). Ueno had been an important religious place for the Tokugawa shoguns, but much of the area had been destroyed in the Battle of Ueno that took place on July 4, 1868 (Meiji 1). Wanting to make good use of the devastated place, and probably interested in erasing the legacy of the Tokugawa Shogunate, the new government’s Ministry of Military decided to build an army hospital and medical school here. The Japanese government accepted the suggestion and turned Ueno into Japan’s very first public park. 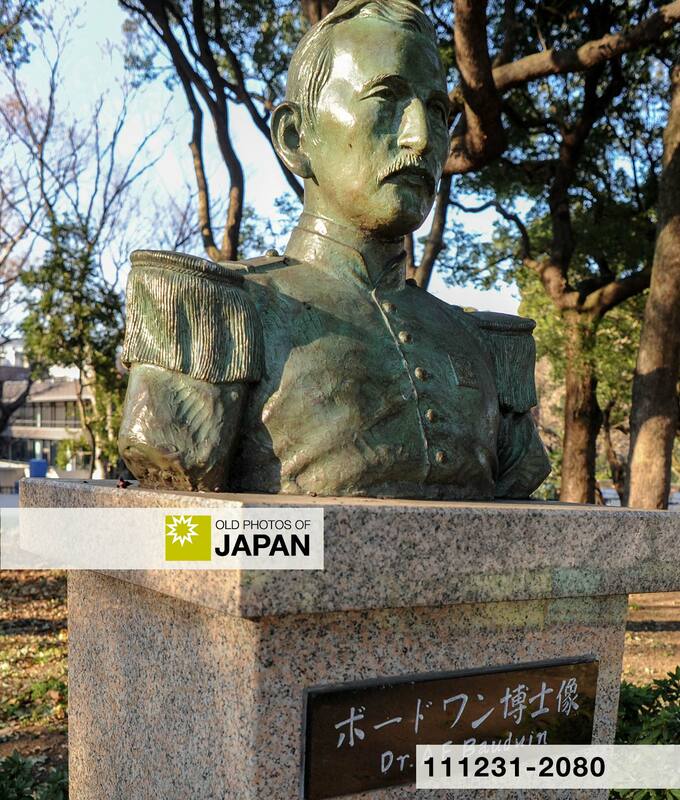 As a token of thanks for his advice, Dr. Bauduin’s statue can still be found in Ueno Park today. Although Ueno Park wasn’t officially opened until May 9, 1876 (Meiji 9), the doctor’s farewell party in 1870 (Meiji 3) took place here. 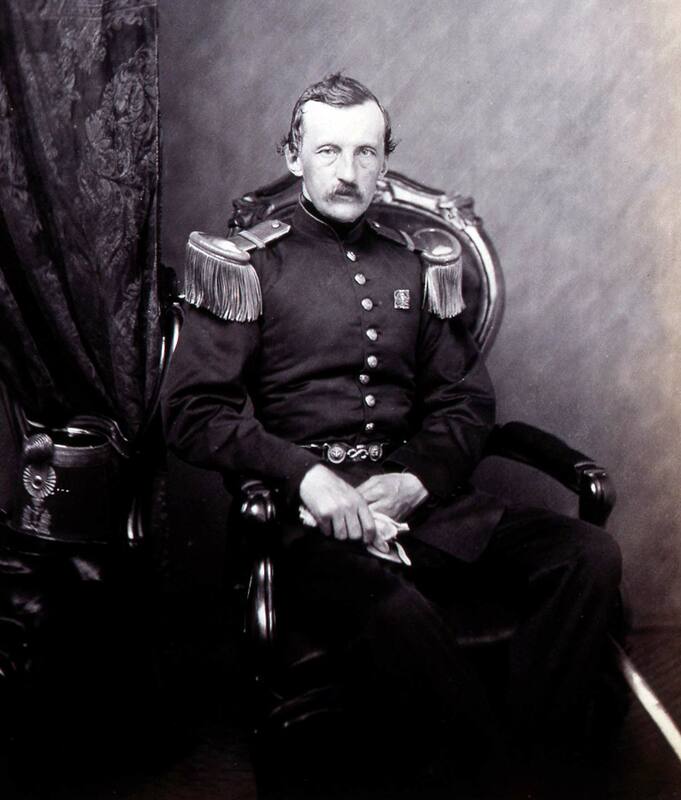 Dutch military doctor Anthonius Franciscus Bauduin (1820~1885). Strongly influenced by large expositions in Europe and the United States, such as the Vienna International Exposition of 1873 (Meiji 6) and the Philadelphia International Exposition of 1876 (Meiji 9), this exhibition was intended to spread technological knowledge and promote industrial development. Technological innovations such as lathes, looms, and the watermill on the photograph on this page were introduced here. The exhibition became the model for all subsequent expositions held in Japan, including the second (1881) and third (1890) which were also held at Ueno Park. It is no exaggeration to say that these exhibitions played a major role in the modernization of Japan. 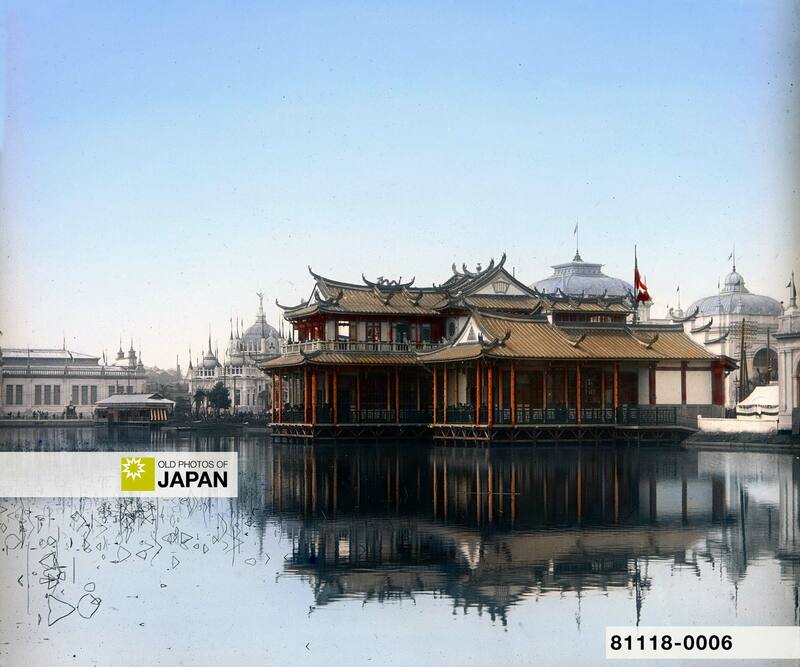 Taiwan Pavilion (台湾館, Taiwankan) at the Tokyo Industrial Exhibition (東京勧業博覧会) of 1907 (Meiji 40). 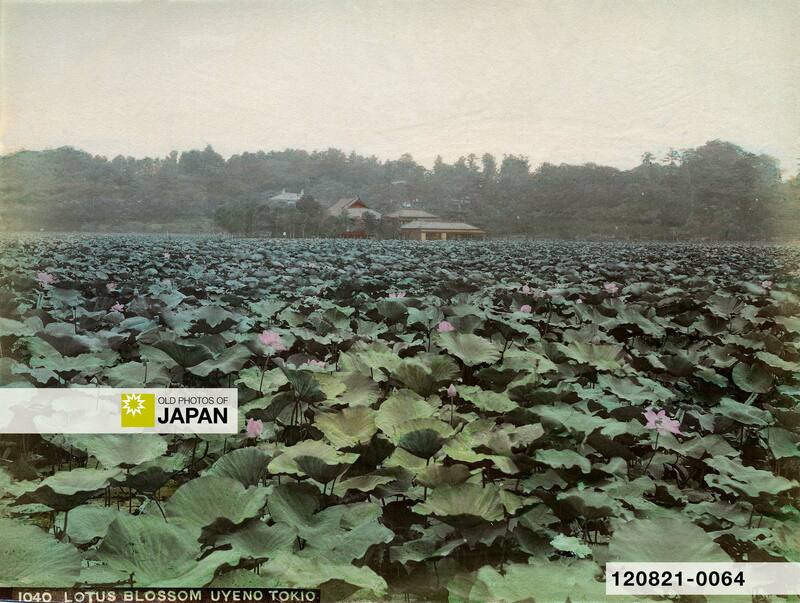 Lotus blossom in Shinobazu Pond (不忍池) in Ueno Park, 1890s. Ueno Park now turned into a magnet for cultural institutions. In the same year that the exhibition was held, the National Museum of Nature and Science, then known as the Museum of Education, was established at Ueno Park. In 1879 (Meiji 12), the Japan Academy settled here. 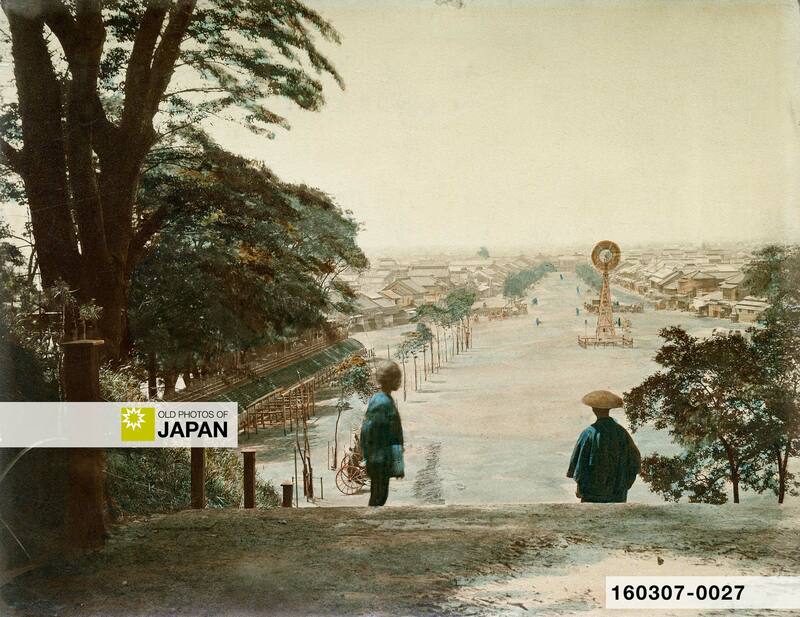 The Tokyo National Museum moved to Ueno Park in 1882 (Meiji 15). That same year, Ueno Zoo also opened here. These were later followed by the Imperial Library (1885)4, the Tokyo Fine Arts School (1889), the Tokyo Music School (1890)5, the Tokyo Metropolitan Art Museum (1926), the National Museum of Western Art (1959), Tokyo Bunka Kaikan (1961), and the Shitamachi Museum (1980). No other place in Japan has a greater cultural density than Tokyo’s Ueno Park. The photo on this page shows the very start of this exceptional concentration of culture and has therefore great historical value. Statue of Dr. Anthonius Franciscus Bauduin in Ueno Park. 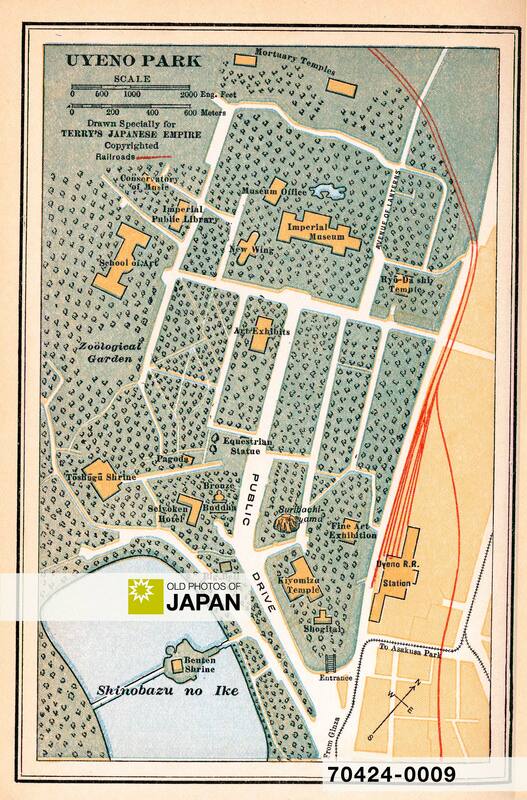 Map of “Uyeno Park” from Terry’s Guide to the Japanese Empire, 1920. 1 Moeshart, Drs. H.J. (2001). Arts en koopman in Japan 1859-1874. Een selectie uit de fotoalbums van de gebroeders Bauduin. De Bataafse Leeuw, Amsterdam: 8. 2 Tokyo National Museum. 6.The National Industrial Exhibition : The Museum and the encouragement of industries. Retrieved on 2018-10-6. 3 National Diet Library. First National Industrial Exhibition. Retrieved on 2018-10-6. 4 The Imperial Library (帝国図書館), became the National Diet Library (国立国会図書館) in 1948 (Showa 23). The former building of the Imperial Library now houses the International Library of Children’s Literature. 5 The Tokyo Fine Arts School (東京美術学校) and the Tokyo Music School (東京音楽学校) were merged in 1949 (Showa 24) into the Tokyo University of the Arts (東京藝術大学). You can also licence this image online: 160307-0027 @ MeijiShowa.com.